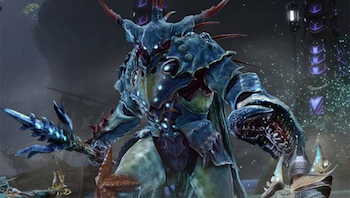 Trion teases a new update as the MMO heads to the Plane of Water. Earlier this month, Trion World's MMO Rift went free-to-play and got a new dose of content, thanks to the 2.3 update. Now, only a few weeks later, Trion is already talking about its upcoming 3.0 update, which will feature a massive new zone, new souls, enhanced item advancement, and new companion abilities. During the nearly three-hour livestream, the developers talked freely about the sizable 3.0 update. If you don't have time to watch the full thing, that's ok, because the guys over at RiftScene did, and they took notes for you. The 3.0 update will focus around the Plane of Water. It won't all be swimming though, as players can expect lots of caverns, Atlantis-type cities, and frozen areas. Players will get four new souls to customize their characters with, including the Support Cleric, Healing Warrior, Tanking Mage, and Healing Rogue. Companions will have a larger role, and they'll gain abilities and levels similar to player characters. Item customization will also become more advanced, and players will have more choices as they upgrade their gear over time. Trion also dropped hints at increased interaction with the dimension housing system, but were vague on what exactly that entails. More details should spill out as the patch gets closer to release.